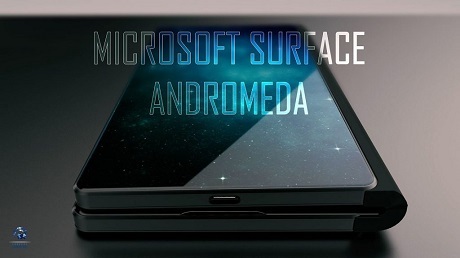 I don’t know if many of you know this, but Microsoft was ahead of its time with the Surface Phone/Andromeda. When the first patents came out it was supposed to be more than a phone and further patents talked about a foldable phone. That was before ZTE Axon M, the Samsung, LG, Huawei and Oppo patents. But the device is still not out, which doesn’t stop designers from envisioning it. Concept Creator rendered the Surface Phone anew, with some novelty associated with the latest Andromeda patents. The project was in limbo last summer and we haven’t heard about it since. The new renders depict a rather bulky and thick device, with a reinforced hinge. The unified screen portion is seamless and we also get two external displays. There’s a bit of Lumia and Surface Pro DNA here and I’m guessing some magnesium alloy too. The hinge area now seems coated with a sort of rubbery material, perhaps to decrease friction. That adds to the thickness, though. The inner screen bezels are rather larger, but the outer screens have very narrow bezels, so that checks out. My only beef with the concept is that the two screens don’t overlap perfectly when closed. But then again, it may be intentional, leaving room for you to open the gizmo. I also can’t seem to spot any camera. If the device comes this year, it’ll arrive either at BUILD in April or May or November, like the last Lumias and Surface units. For more visit OUR FORUM.